Tag Archive | "Lenovo Miix"
Live session has ended. Recorded videos below. YouTube Videos will be made during the show. Bring cold beer. I’m likely to stay on until 2300 for Q&A. A lot of you have asked about the differences between the Lenovo Miix 2 10 and the ASUS Transformer Book T100 so I’ve been onto Intel Germany and they’ve helped us out with a T100 for us to test with. All your questions will be answered soon! 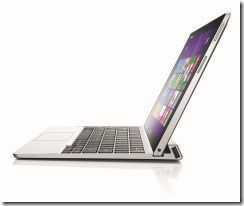 After a wobbly start in the US I think the Lenovo Miix 2 is about to take off. 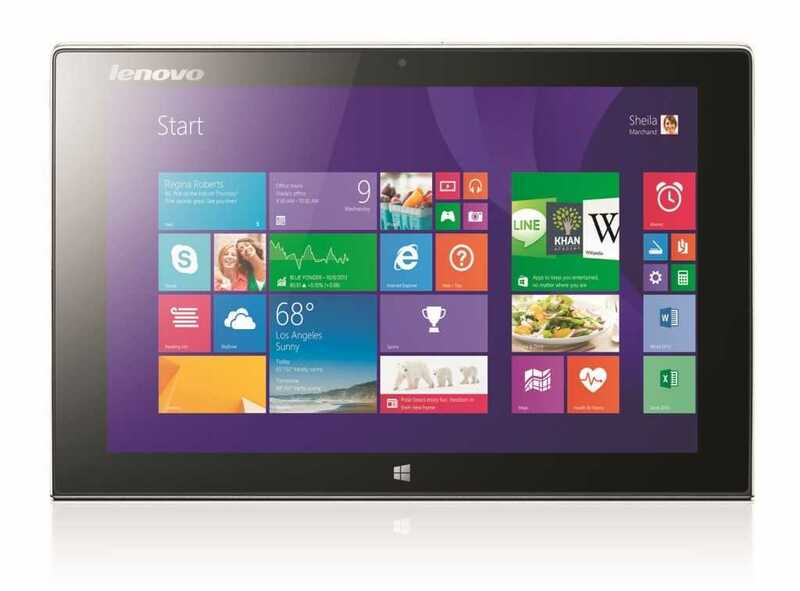 Lenovo have dropped the unexpectedly high price for the 128GB model to $599 and now offer the 64GB version at $499. With that they’ve made good on their original pricing plan. 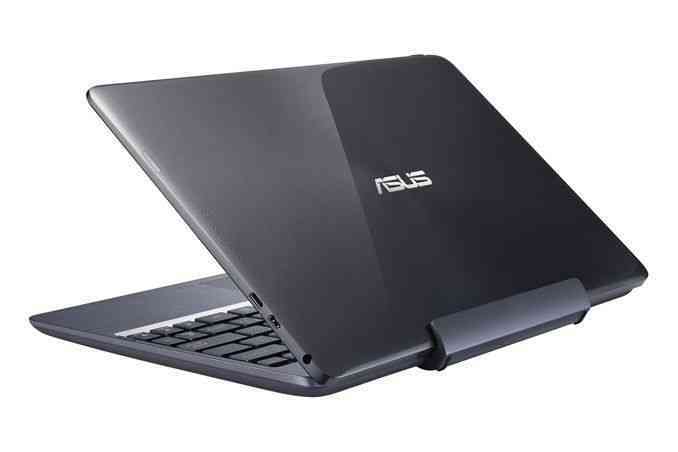 The price is $100 more than you can find the ASUS T100 for though and that option, which has been very popular over the last 2 months, has longer battery life! The question of T100 Vs Miix 2 10 is a complex one and I will be helping you to answer that question soon as both devices are here in the office now. Obviously the screen and keyboard are the main points of comparison but there’s also the availability to consider. The T100 has been so popular that it’s being offered at $499 in some cases where it’s in-stock. Click the images for the specification pages. 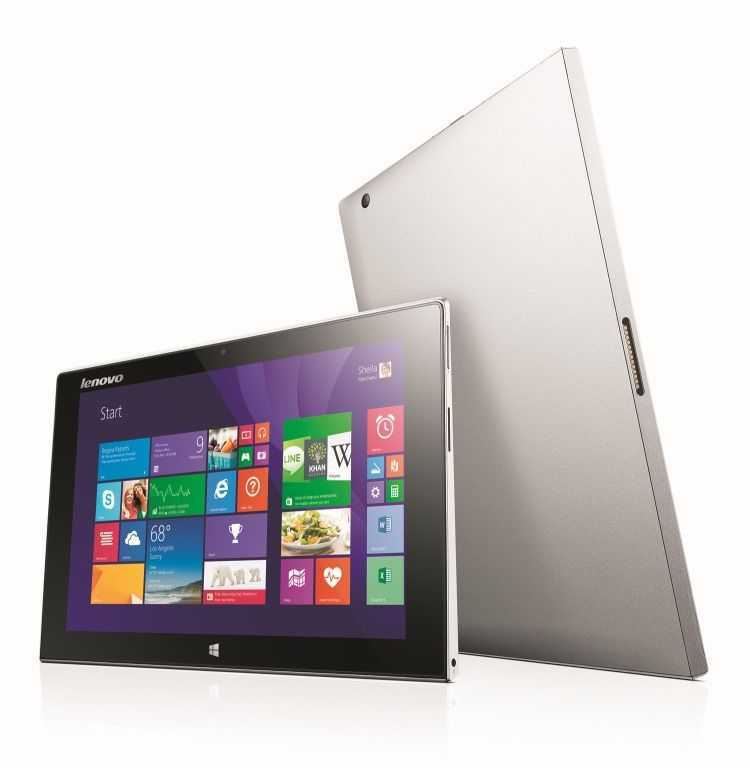 The Lenovo Miix 2 10 is now available in Europe and, lucky for us, in stock near the UMPCPortal office. Here’s an unboxing of the little fella which, so far, seems to be excellent value for money. An 18-minute unboxing and overview demo is available below. I paid 369 469 Euros at Conrad in Bonn and got the 64GB version with 1090×1200 screen, keyboard dock and Z3740 CPU and so far everything is working nicely. For those that know the Acer W510, a popular 2-in-1 based on Clovertrail in 2014, this beats it in most areas,most notably in browsing speed. Total weight is 2.3 pounds. The tablet weighs about the same as the W510 at 606 grams / 1.34 pounds. Battery capacity is 24Wh, not much compared to the Acer W510 but good enough for 6 hours of Web work by my reckoning. As for the keyboard dock it seems OK. There’s a slightly abnormal layout due to the lack of a function key row and it’s going to need some time to get used to but the keys seem to be accurate. The mousepad is OK but there’s no multi-touch. I’m writing this article on the Miix 2 10 right now. Screen angles are good but the screen could be a little flat in terms of color. Auto-brightness works but it doesn’t seem to be that bright at max settings. 1920×1200 is a very high density that could catch you out in desktop mode with some programs. The attachment to the base is easy to use but of course, only at one angle. Charging is via USB or power port on the tablet. The dock has two USB2.0 ports. The speakers are loud and accurate on the tablet and the additional speaker on the dock adds a little bit of lower-end range, but not much. It’s not what I’d call Bass. That’s it for now. I’ll get to work on the full review so stay tuned. Feel free to ask questions below. Tablet, Laptop , Easel. The Lenovo Miix 2 10 is based on Baytrail, weighs 1.3 pounds (tablet-only) and looks like it will kill the market for the Acer W510 stone dead. 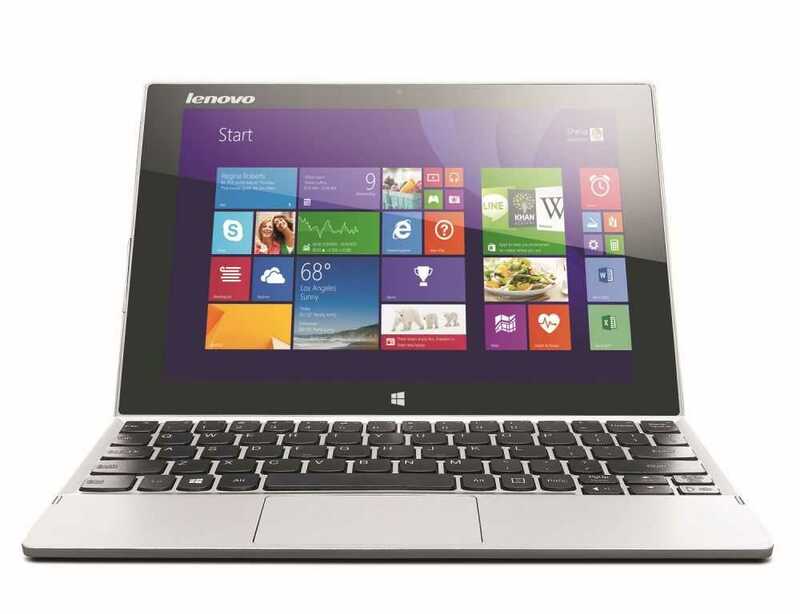 Let’s hope the keyboard is better than the one on the Lenovo Lynx! The 10-inch MIIX 2 starts at $499 and will be available in March. 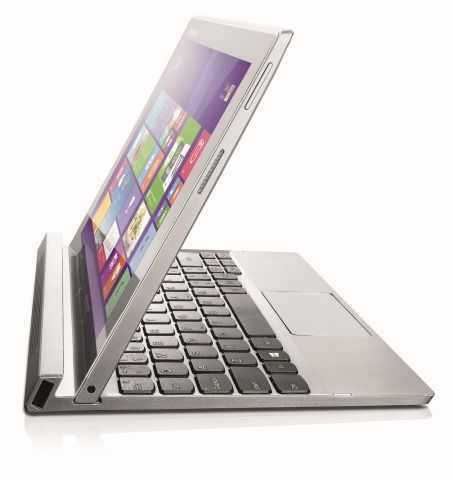 The Lenovo MIIX 2 is ideal for those who frequently use both a tablet and a laptop. The Windows 8.1 tablet can be attached to a keyboard dock, instantly turning into a full-performing laptop perfect for entertainment and productivity while on the go. Available in ultra-portable 10.1-in and performance-focused 11.6-in models, MIIX 2 gives users the ability to easily switch between three modes – Tablet, Laptop, Stand – for specific computing needs. 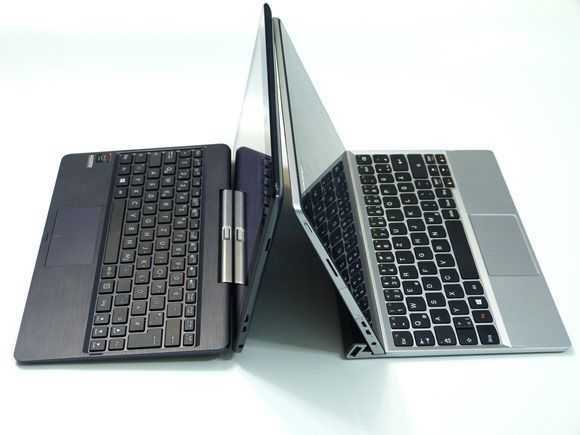 Obviously the 11-inch model is more Ultrabook-focused so we’ll be covering that over at our sister site. Fingers crossed that it has the Z3770 with max 2.4Ghz clock. 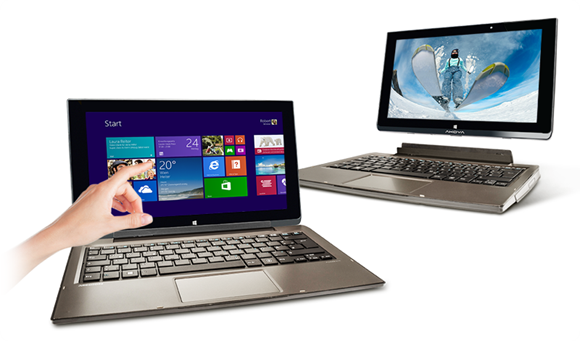 It’s clear that Baytrail-M PCs will be the low-cost options in the touch notebook and 2-in-1 space. This Medion Akoya P2212T, spotted in Austria, comes with a Celeron N2910, a Full-HD 11.6-inch screen, 64GB SSD + 500GB HDD and costs only 399 Euro, inclusive of taxes. There’s even an AC-capable WiFi module. Where’s the catch? Lenovo today officially announced its entry into the rapidly expanding 8-inch Windows tablet category with the official announcement of its previously teased Miix2 8-inch tablet. Baytrail was officially launched as the Z3000-series Atom processor a month ago and we’ve already seen a good range of devices launched that will be using it. Here’s an overview of the platform, the products launched so far and with some though about what could come over the next months. Processors with the D marking are limited to 2GB RAM and smaller screen sizes (1920×1200.) The others can use up to 4GB RAM, have a bigger memory bus and support 2560×1600 max screen size. These non-D variants are the ‘best’ in terms of mobility. 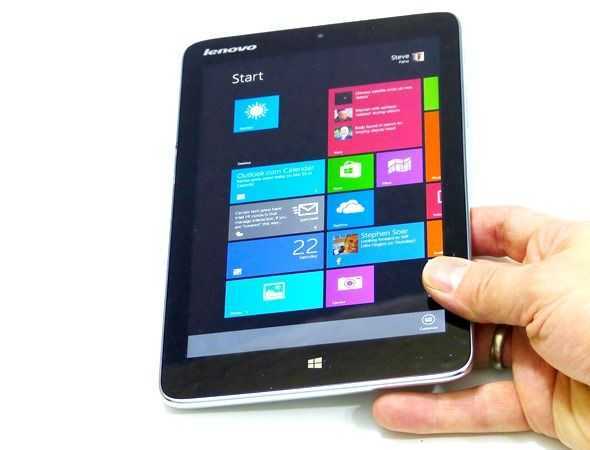 You’ll see these appear in low-cost Android tablets but you’ll also see these appear in low-cost Windows tablets and thanks to some help from the Microsoft Small Screen Touch program you’ll see products at lower cost than the Clovertrail variants of last year. The SST program also includes an Office Home and Student license. So far we’ve seen prices starting at $299. 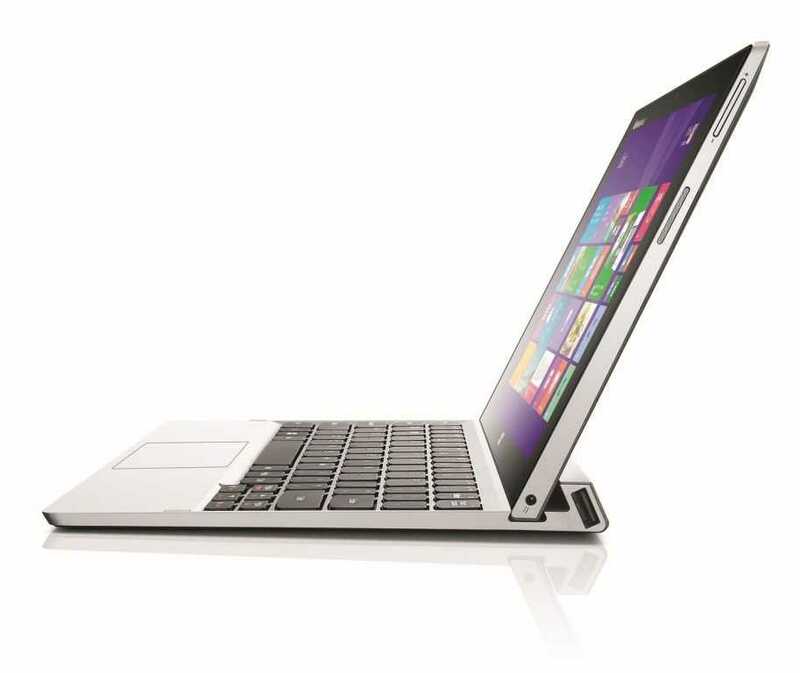 In our opinion one of the most interesting products to launch so far because it’s a 2-in-1 for $349 that also uses the successful ASUS Transformer brand. The 2-in-1 segment is going to get a big push from Intel and Microsoft over the next quarter and at this price you’ll see a lot of interest, news and sales. Profits are another matter but for Microsoft right now, numbers are more important than profits if they want to really boost the economics of developing those important high-quality apps for the Modern UI. 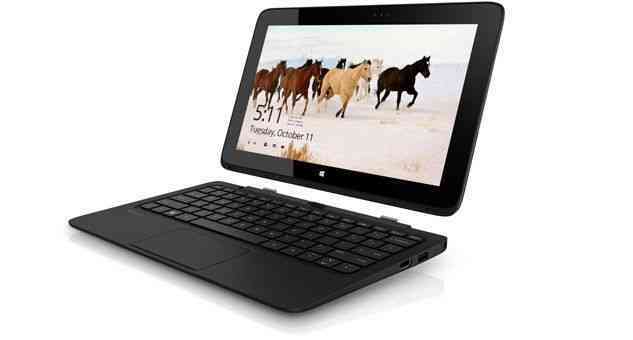 We’ve got a hands-on video with the Transformer Book T100 here with full specifications and more information here. 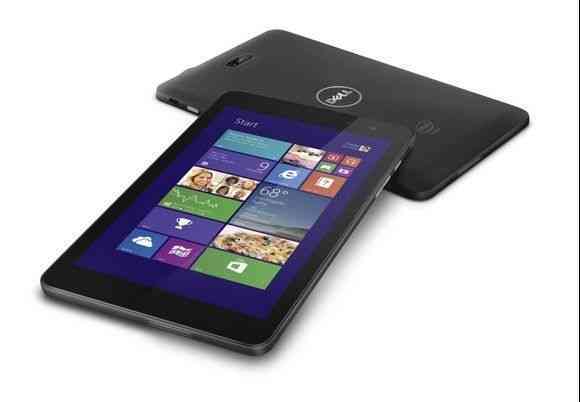 Two Dell tablets were launched this week but we got a sneak preview of the Dell Venue 8 at IDF. The Venue 8 offers a digitzer and is clearly aimed at the pro market. Or is it? 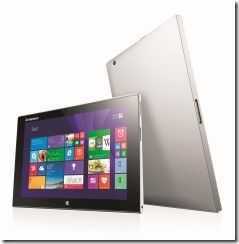 The $299 entry-level model is clearly aimed at consumers, just like the other 8-inch tablets. It’s one of the first of the 8-inch tablets that we’ve had detailed specifications for and it’s interesting to see the battery size. 18Wh is a very small battery indeed (we remember 2 hours of battery life on 7-inch Windows XP tablets that have batteries twice that size) so the first battery life tests are going to be something to watch-out for. We suspect a minimum of 3hrs in heavy use and up to about 8 hours of tablet-style usage. Remember this is an always-on Windows product though so with screen-off, you’ll probably be able to get through a day of basic tablet use. Don’t expect battery life records to be broken with the Venue 8 but because it’s under 400 grams in weight Dell have a product that will be very mobile indeed. There’s no video output port but it looks like you’ve got WiDi/Miracast for a potential full-HD output. That’s good enough for putting videos on a large screen, basic web-working and powerpoint presentations as long as you buy a $50 WiDi adaptor. [Intel should really be encouraging OEMs to make a $30 Chromecast-style adaptor. When I asked at IDF in Sept. they couldn’t give me an answer.] There’s a range of accesories but we’ll have to wait to see how much those, and the digitizer-enabled version are priced. Full specifications here. Our hands-on video here. 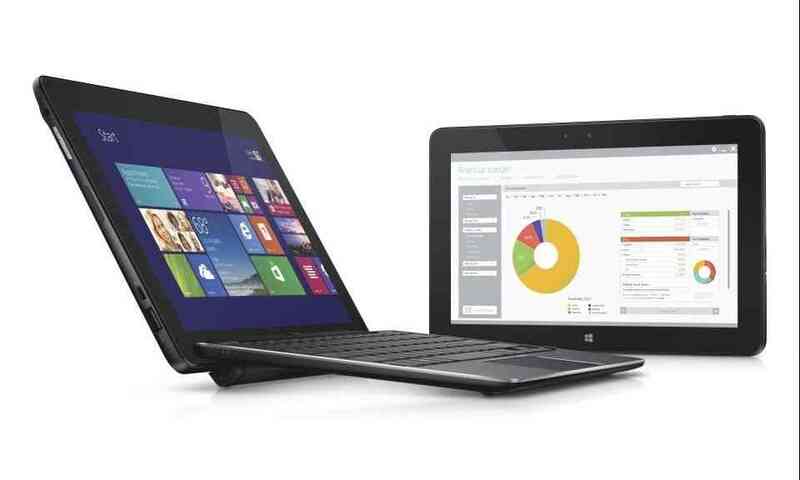 The Dell Venue 11 Pro is a 10.8-inch FullHD tablet (not 11.6-inch) with matching keyboard and case accessories that make it look like the Surface Pro or Tap 11. One of those keyboards includes a battery so you’ve got a product that spans a range of uses. The 726 gram tablet should be light enough, like the Sony Tap 11, for casual sofa-based usage but should also be big enough to provide a quality table-based productivity experience. There’s a digitizer (this could be an option as on the Venue 8 Pro.) The tablet, without any included keyboard, will start at $499 so anyone looking at the Surface Pro 2 should also be considering this, especially as Dell are offering slightly thicker, heavier and more expensive versions with Pentium and Core CPU options. 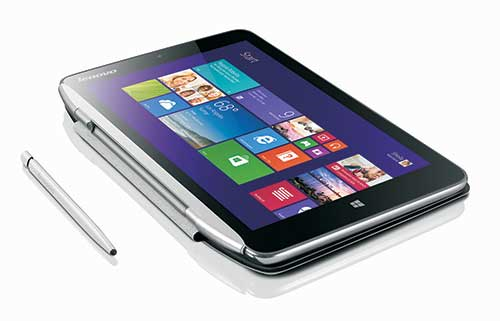 The battery in the tablet is rated at 30Wh which is similar to the the battery in the ASUS Transformer Book T100. ASUS are saying that you’ll get 11 hours out of that. Full specifications here. The second of the 8-inch Windows tablet options in this list is the Toshiba Encore WT8. With its dual-array mics it’s going to be a good contender for a quality Skype experience but apart from that it’s much the same as the other Windows 8 tablets. The 349 Euro 64GB version is likely to be a better seller than the 299 Euro entry-level 32GB version. It’s slightly heavier than the Dell Venue 8 Pro but it does have an HDMI-out port. A full version of Office is included. Full specifications and further links, including our video overview, can be found in our database. 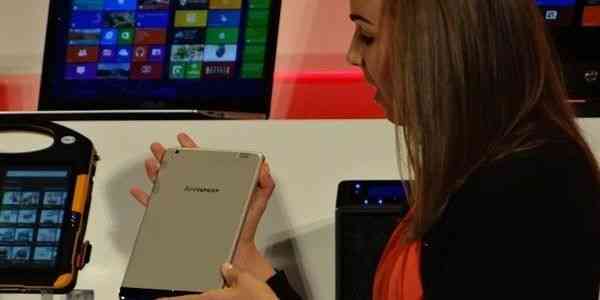 Acer were the first to launch an 8-inch Windows 8 tablet. 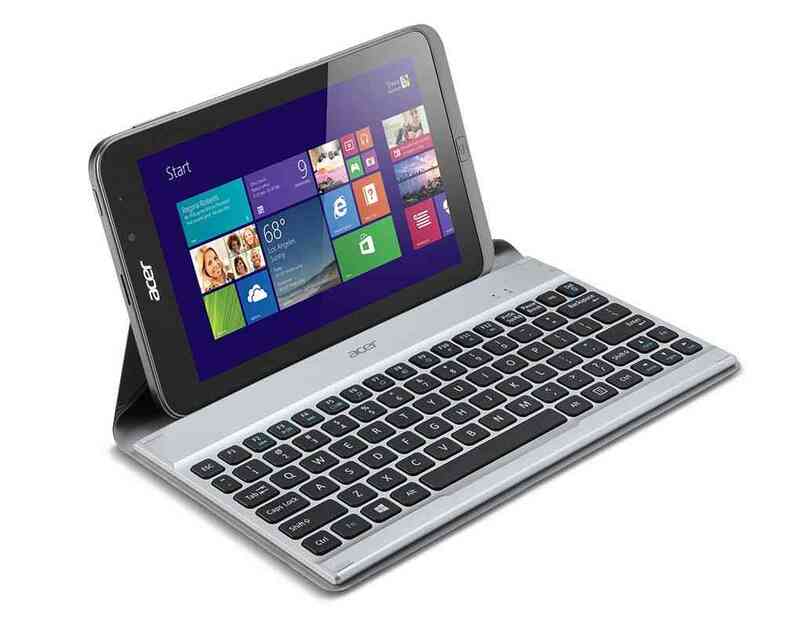 The Acer Iconia W3 was available earlier this year and it used the Clovertrail platform. The product was pretty good and well-priced but it has a poor screen and wasn’t treated well in reviews. The W4 should fix that screen problem, add more performance and ride on Windows 8.1 improvements. Again, there’s not much difference in specifications compared to the other 8-inch offerings but there’s an HDMI port and Acer may also carry over their low-cost keyboard/case option from the W3. 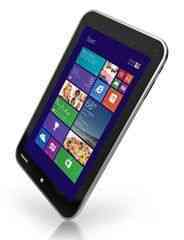 Pricing is unconfirmed but Acer were always competitive in that area so keep an eye on it. More information, including a video, in this article. With a slant toward business and education the Omni 10 brings 1900×1200 to Baytrail in a 10-inch screen. An optional digitizer (not officially confirmed) and 3G/4G modem option makes it attractive for on-the-road work. There’s a Bluetooth keyboard and stand/charging station too. HP are saying this will run for 9 hours. The price is an interesting 399 Euro (32GB version) and there’s a 31Wh battery inside. Weight is 650 grams. 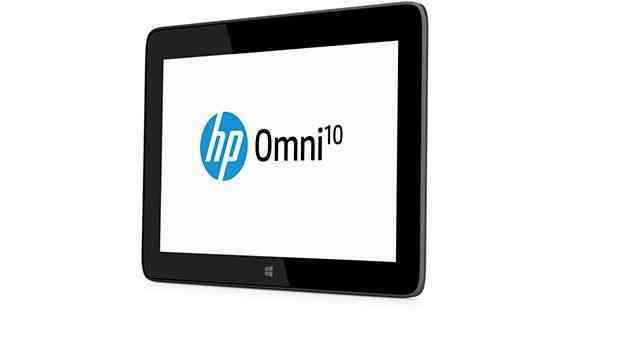 The HP Omni 10 will be available in November. All specifications here. A fanless, detachable 11.6-inch tablet powered by the ‘latest’ Intel BayTrail SOC. It’s going to enter at $599. A 1366×768 screen isn’t that impressive but should be comfortable for work on the 11-inch screen. 4GB RAM will be an option with 64 or 128GB of eMMC storage, unless this is a Baytrail-M device in which case it could be a more exciting SATA drive. 500GB of drive in the keyboard along with an extra battery sounds too good to be true for the price but let’s wait to see exactly what the $599 is going to bring. Availability is said to be Nov 17th 2013 for the US market with three colors: Pearl White, Flyer Red and Sparkling Black. This one is unlikely to be a global product but it got a very interesting set of specifications. Using an IGZO screen it offers 2560×1600 resolution on 10-inches! For some desktop apps that will be a problem; The GPU will have to work extra hard too. Yes we think it’s overkill but if it works, and if IGZO brings promised battery life advantages then let’s give it a chance. It’s due in early 2014. Update: This has now been announced as the Miix2. 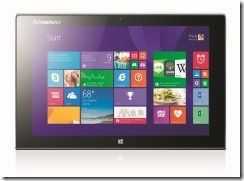 Finally, a Baytrail tablet from Lenovo that hasn’t been launched yet. Intel held up the Miix 8 at Computex this year and then again at Intel’s IDF event. (Mike Cane has a good set of screen grabs here.) It’s an 8-inch tablet and that’s all we know right now but we’re fully expecting this one to launch in the next few weeks so stay tuned for more information. We’re expecting LG to launch something soon and Samsung have been suspiciously quiet with Windows tablet announcements too. 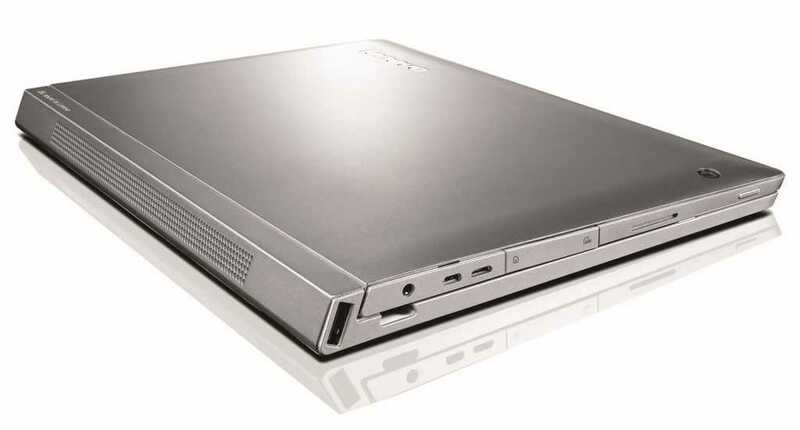 Sony have already launched the Tap 11 which uses a Haswell CPU so although there’s space in their portfolio for a Baytrail 10 or 8-inch tablet, we’re not expecting it in 2013. 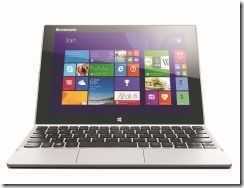 Baytrail-M devices could be on the horizon but it doesn’t look like that will happen in 2013. For an overview of what’s possible with Baytrail-M, see this article. 8, 10 or 11-inch devices are ready to ship when Windows 8.1 launches on the 18th October and you’ll have a choice starting at $299. The first 2-in-1 devices start at just $349 and it looks like we’re going to get something for productive table-top fans with the Dell Venue Pro 11 and HP Pavilion 11 X2. Windows and touch have been available for a year now but it’s devices like these, at prices like these, that will start to change the numbers in the important consumer segment. It’s a great line-up for Q3 2013. Which one have you got your eyes on? The wheels are starting to turn again for the Windows-based handhelds that were once called UMPCs. First the Acer Iconia W3 and now something from Lenovo. 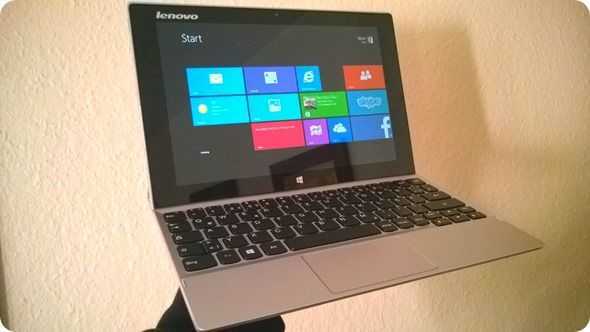 The Lenovo Miix 8 was shown at a Microsoft press event at Computex although there’s little information available.